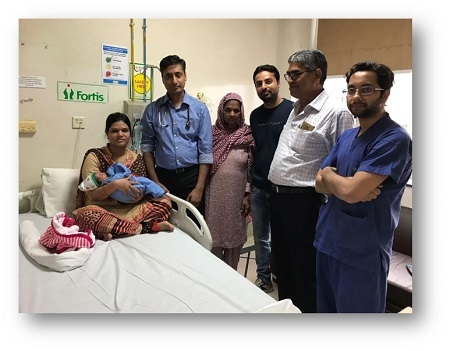 Sharing his account of an incredible journey of recovery, Dr Sunil Agrawal, Consultant, Neonatology, recounted that a very sick infant was brought to Fortis Mohali on 17th January, 2017. The baby had severe infection in blood and pneumonia which had spread all over the body including the brain and intestine. His platelet counts were very low and he was bleeding from his mouth, lungs and stomach. Treatment began in the form of ventilator support, fluids, antibiotics and other supportive care. He had a very stormy course, 14 platelet transfusions, 35 days of ventilation support. The baby was discharged hale, hearty and healthy, after 45 days of hospitalisation. Dr Sunil says, ‘this case has taught us not to give up, never lose hope and yes, miracles do happen in medical science’. We wish the little one the best of health!